This versatile console table offers great storage and a unique industrial look. The piece features open and concealed storage with two open shelves and two drawers. 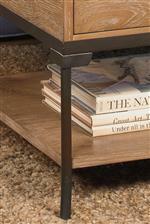 Bronze metal legs paired with rustic woods give the piece its industrial look. Use the console behind a sofa, in a hallway, or put your TV on it and use it as a media console. The 2013 Sofa/Media Console with 2 Shelves by Null Furniture at Westrich Furniture & Appliances in the Delphos, Lima, Van Wert, Ottawa, and Celina area. Product availability may vary. Contact us for the most current availability on this product.